Since you last saw our master ensuite, I have been working away painting the ceiling and applying the light grey colour we had chosen for the upper part of the walls. Now it's time for the tiling! For our Art Deco inspired ensuite, I chose a classic: white subway tiles with a ceramic dado rail. Running Bond (like brickwork) is the pattern most often used with subway tiles but because we already had used that pattern in another shower room (not with subway tiles, but still), I decided to go for a 33% offset pattern this time. Tiling is the first DIY skill I taught myself, and I've done enough projects by now to feel very confident doing it by myself. Still, it's always nice to get a helping hand on a project, and I was very grateful for Hubby's help with this one. So if you see manly hands in some of the photos, those are his hands, not mine! Unsurprisingly, the materials and process for hanging wall tiles is very similar to that for laying floor tiles, with a few exceptions. Usually, tiles suitable for walls are not as heavy as those used on floors, and so the trowel used to spread adhesive when hanging wall tiles should have grooves that are narrower and shallower than the ones used for floor tiles. The tile spacers used should also be smaller in size, typically 1.5mm or 2mm for wall tiles. Something used when tiling walls that is not typically used on floors is trim. For this project, we used a thin stainless steel trim to hide the cut edges of the tiles on either side of the shower enclosure. Trim can also be used when tiling around shapes such as a window reveal, or can be inserted between tiles to create a decorative border. We did both in our main bathroom, using a white plastic trim around the window and stainless steel trim as a decorative border. Note about grout: If tiling an area that is prone to dampness, such as a bathroom, be sure to use grout that is resistant to mould. Also not all grouts are suitable for use in showers, so do check that if tiling a shower area. When tiling a wall, do not assume that you can just start by laying the bottom row of tiles along the floor as it's unlikely that the floor is level. It might not be apparent now, but once you start tiling, the regular grid lines will highlight any discrepancies in the room and if your tiles are not exactly level, your walls will look crooked. So it is better to create a level surface by fixing wooden batons to the wall and to use those as your starting point. The bottom row of tiles is actually last to go on the wall, and it is the second row of tiles that go on first and that should sit on the baton. The distance between the floor and the top of the baton should be less than the height of one tile. This means that the tiles on the bottom row will need to be trimmed slightly. Otherwise you could end up placing full tiles where the floor level is at its highest, leaving awkward gaps to be filled in where the floor dips down. Trimming the tiles on the bottom row is also the best way of visually disguising any unevenness in the floor. In our master ensuite, I wanted the wall tiles to stop a few centimeters below the height of the windowsill. I worked out how many tiles would would fit in that space - including spacers (and not forgetting the dado tile). Then I figured out where the second row of tiles should start so that I could determine where to hang the batons. A laser level is a great tool for ensuring that the batons are level. We started by marking the wall. Next, we drilled holes in the batons and held the batons along the level line to mark the position of the holes onto the wall. Then we drilled the wall at those points. Next, we hammered a plastic plug into each hole in the wall. This ensures that the batons are well secured to the wall, which is important because they carry a lot of weight once the tiles go on. As we fixed the batons to the wall, we checked to ensure that each one was level, individually as well as relative to one another where they meet in the corners. After we had fixed the batons to the wall, it was apparent just how off-level the floor really is in this room. You can see how it slopes downwards considerably towards the left side of this photo. This is why you should never use the floor as a starting point for wall tiles. With the room prepared, it's time to move onto the tiles themselves. If you haven't done so already, do please read Laying Floor Tiles to get some more tips about things to watch out for when preparing your tiles, such as dealing with batch variations etc. If you are doing a simple stacked pattern, with straight vertical rows of tiles, then you can skip ahead to Planning. But the next step is helpful when doing a pattern such as running bond or, in this case, a 33% offset. To help with offset pattern, I market a set of tiles one-third along their length using a strip of masking tape initially and later on, as you will see in some pics, with a wipeable marker. This made it easier to keep the tiles aligned to the the 33% offset pattern as the rows built up. As well as marking the tiles, I also drew guidelines on the wall. Using the laser level, I marked a vertical line on each wall. (I had to be careful when spreading the adhesive to ensure that this line remained visible.) I started each new row at that vertical line and worked outwards across the row from there. As you can see in this pic, I also loosely sketched out the height of each row onto the wall. This is helpful when spreading the adhesive (more on this in a moment). There will always be an awkward bit of the room where you can't quite fit a full tile at the end of the row, so you need to plan for this in advance. Most importantly, you want to make sure that you won't be left trying to fill a gap with narrow slivers of tile that are difficult to cut and fix to the wall. If so, just shift your starting point left or right to avoid this. You should also try to make the awkwardness look as visually appealing as possible. With this project, the tricky bit was working around the shower enclosure. I started by sitting some tiles loosely on the baton to see where the awkward bits of tile would end up. From this I could see that four full tiles would fit along each side of the shower tray, with a bit left over. If I started in the corner and worked outwards, then the awkward bits would be visible outside the glass shower enclosure that we were going to install, which I didn't want. So I decided to start at the outer edges and work inwards so that the leftover tiles would be in the corner. To do that, I marked vertical lines on the wall to correspond with the outer edge of the shower area. Then I screwed a couple of blocks onto the baton to use as a guide to position my first tiles. Note that the starting blocks are offset from the vertical line because that's the pattern I was using for this project. With all the preparations and planning done, it's time to start tiling the wall. Hubby mixed the adhesive and I spread it along the wall using a notched trowel. The adhesive will dry pretty quickly, so if you spread too much at a time and aren't quick enough getting the tiles onto the wall, you may find that the tiles won't adhere properly. In that case, you will need to scrape the dry adhesive off the wall and apply fresh adhesive. That's why I sometimes find it useful to have a rough sketch on the wall so that I can better gauge how much adhesive to use and pace myself accordingly, especially if I'm doing a new or tricky pattern that I think will slow me down. Press the tiles into the adhesive, applying even pressure to prevent lippage. I started in the shower area by placing the first tiles against my wooden starting blocks and working inwards towards the corner as planned. Once those tiles were firmly fixed to the wall, I removed the wooden blocks from the baton and continued tiling outwards across each wall. It is essential to use tile spacers - two along each edge of every tile - to ensure that the rows remain level and the tiles are all square square as the job progresses. Eventually, I had reached the point where the half-height tiling would stop. Here you can start to see those awkward bits in the corner of the shower enclosure, especially on every third row because of the pattern I'm using. Sometimes you can work it so that the awkward bits are barely noticeable, but with this project I prioritised the other areas of the room instead and so had to sacrifice appearances here more than I would usually like. However it becomes less obvious when the room is completely finished and there are other more interesting things to distract the eye. I decided to continue tiling the shower enclosure first and come back afterwards to add the dado rail. I used trim to hide the edges of the tile where the shower enclosure stops. The trim is fixed into place first and the tiles are stuck over the flange to hold the trim securely. I cut each piece to size and used a staple gun to fix them to the wall. Then I continued tiling up along the wall, using the steel trim as a guide at the outer edges. When cutting the tiles for the edge here, I found it helpful to have a sketch of the tiling pattern to keep me from losing track of the 33% offset pattern. Where tiles needed to be cut for the inside corner, I used this handy little trick. Place the tile you want to cut against the last whole tile on the row. Then slide another tile into the corner with a spacer between it and the wall, and use it to draw a line on the tile you want to cut. Also mark on your tile which piece to keep and which gets put aside for now - remember you may be able to reduce wastage by using the discarded piece in another spot. Using this method, you will cut perfect tiles every time. It's like magic! Except that it's really maths (which is just as mysterious as magic to me anyway). 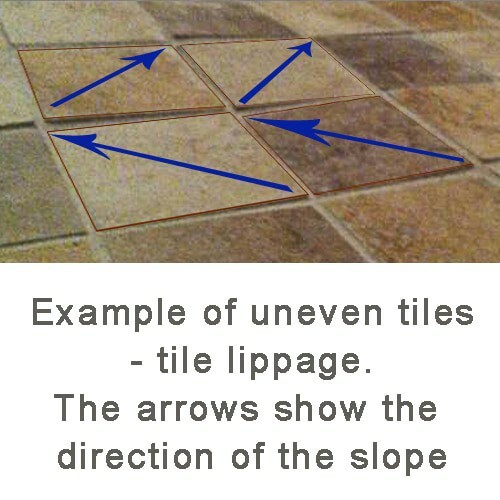 To see how to cut a holes for plumbing etc., I give a detailed explanation in: Laying Floor Tiles. Wait until the adhesive has fully set before removing the tile spacers or the baton. Then you can start fixing the bottom row of tiles, cutting them to size as you. Please refer to Laying Floor Tiles for a full explanation of the grouting process. The choice of grout colour is entirely subjective. You may choose to match the tile color as closely as possible to minimise the appearance of the grout lines. Or, because grout is now available in every colour of the rainbow and more besides, you could choose to make a feature of the grout. Here, I choose something in between those two options, going for a soft grey grout against the white tiles. I placed a row of ceramic dado tiles along the top edge of the subway tiles as I thought it suited the period look I wanted to create in this room (read more about that in Master Ensuite: Design Plans). I used the same principles outlined above to apply the subway tiles except that the deeper profile of the dado tiles requires that you pack the back of the tile with adhesive as well as applying adhesive to the wall. It helps to keep a damp rag to hand to wipe up any excess adhesive that may ooze out above the top of the tiles. When working with tiles that are three-dimensional such as these, you will need a tile saw that can make a mitre cut when cutting the tiles for the corners. I choose to use the floor tiles as a skirting/trim because I like the streamlined look and it is more waterproof than wooden trim in wet areas. Because the floor tiles were thicker than the wall tiles, I had to chip off some of the plasterboard so that the floor tiles sat flush with the wall tiles. At the top of a part-tiled wall, it is a good idea to use silicone sealant to prevent moisture from getting behind the tiles and also to create a neat finish. To get nice even lines, put a strip of masking tape either side of where you want the silicon bead to be. Then apply the silicone using a silicone gun (caulking gun). Smooth it out with a wet fingertip. And then remove the masking tape. And there you have it - a perfectly neat and waterproof finish to your tiled wall!